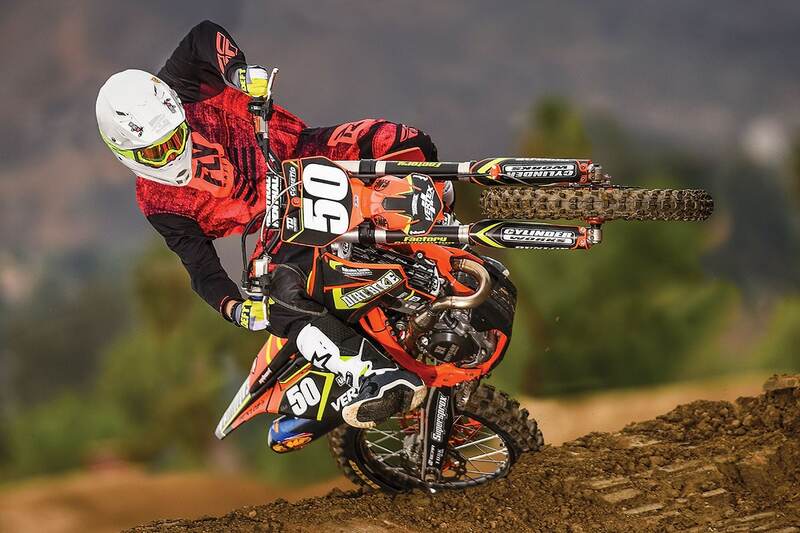 Test rider Spencer Clark was all smiles after riding our KTM big-bore project. 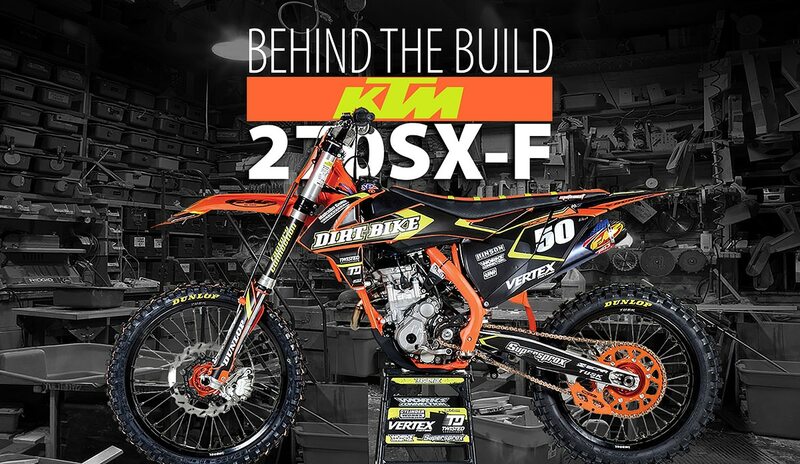 We found a 2016 KTM 250SX-F in decent shape online, so we bought it. The 2016–’18 chassis and engine configuration are almost identical, or at least close enough for what we had planned. If you remember, 2016 was the last year of WP 4CS forks. We had a set of AER-48 air forks, so we put those on right away. Factory Connection went through the suspension completely. All oil, seals and bushings were replaced. Our target setup was geared towards a vet intermediate rider, so we retained the use of a stock shock spring and used pretty much stock air settings in the AER-48 fork. Factory Connection did re-valve both ends internally, trying to increase rider comfort on small chop, but we weren’t done with the chassis yet. Because the bike was used, we decided to tear it all the way down for an in-depth inspection, and it’s a good thing we did. We found some neglected bearings that didn’t need to be replaced but were definitely in need of some TLC and grease. While we had the bike apart, we sent the main frame to Chris Johnson at San Diego Powder Coating for some bright orange coating. The Decal Works semi-custom matte finish graphics gave our 270 project a very distinctive look. Most of our time and effort on this project went into increasing engine performance. We did this in a couple of different phases. For phase one, we installed the brand-new 270cc big-bore kit available from Cylinder Works. 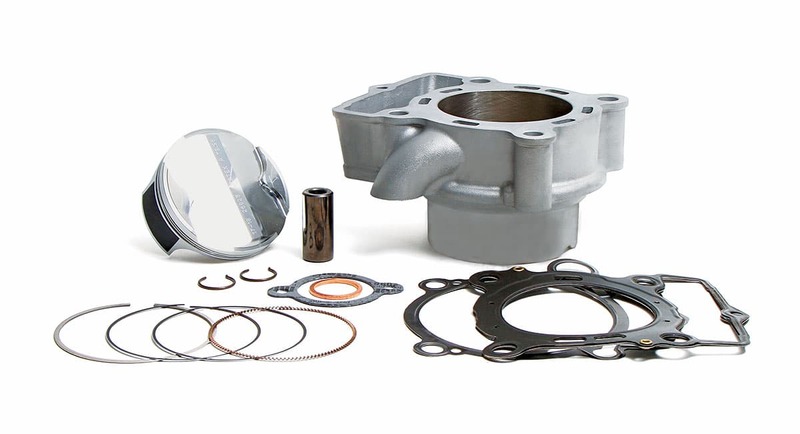 The kit comes with a cylinder, gaskets, piston, rings, circlips and a wrist pin. These items bolted right on with the rest of the engine remaining stock, including mapping. Yes, we noticed performance increases just installing the big bore-kit—more low and bottom end than top end. Pleased by the increases, we decided to go all out in phase two and enlisted the help of Jamie at Twisted Development to make everything flow together. In this phase, we introduced a Vortex programmable ECU, complete FMF 4.1 titanium exhaust and head modifications by Twisted Engineering. 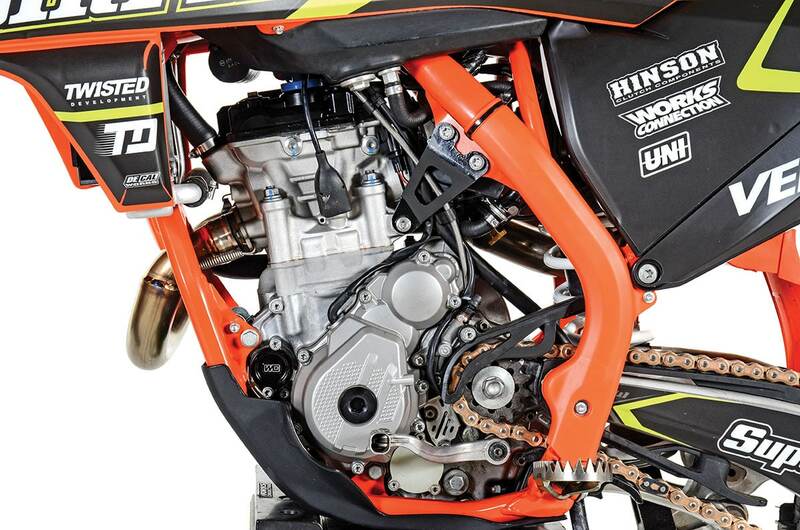 The Cylinder Works KTM 270 kit comes with everything you see here. Jamie is the mad scientist behind much of what goes on at Twisted Development, and before he got on the computer and started figuring out new maps for our 250SX-F project, he had to do some head modifications. Cutting the head combustion chamber to match the new +3mm big-bore kit was first on the list, but that was just the beginning. This will ensure proper compression, delivering the best fuel burn possible. Twisted also ported the head for more flow to optimize performance gains of the increased bore size and cut the valve seats to new specifications. With the head modifications complete and installed back on the bike, Jamie headed to the dyno armed with his computer to figure out mapping. 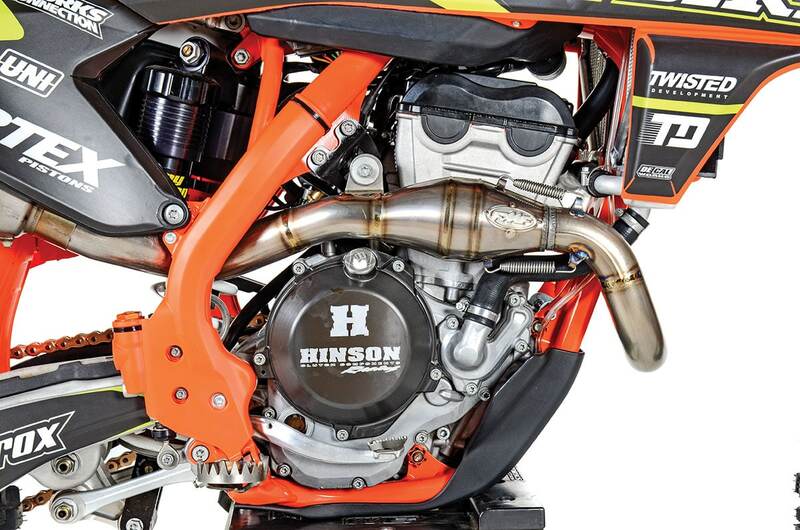 A complete Hinson billetproof clutch, Cylinder Works big-bore kit, FMF exhaust and some magic from Twisted Development transformed our KTM powerplant. The Vortex 10 Map ECU we used plugs directly into our KTM 250SX-F standard wiring harness and works with all the standard engine sensors, such as ECT (Engine Coolant Temperature), IAT (Intake Air Temperature), MAP (Manifold Absolute Pressure), TPS (Throttle Position Sensor), and CPS (Crank Position Sensor) to adjust fuel and spark timing in all weather, altitude and load conditions. Although the Vortex ECU has the capacity to store 10 different mapping possibilities, we are thankful that Twisted Development knows that can be confusing for the average guy. Jamie simplified things by installing just two maps for us. 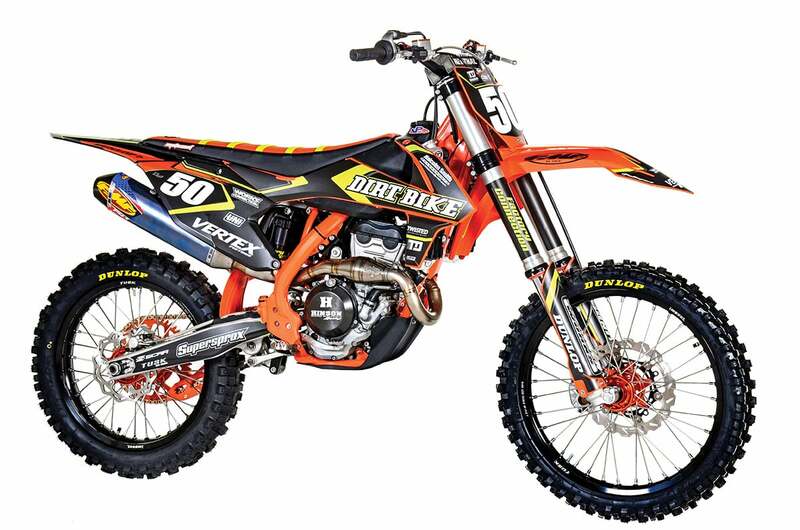 Map one is designed to run on a mixture of race gas and provide the most performance. Map two is made to work on pump gas and provide reliable performance. The last performance item we added was a billetproof clutch kit from Hinson Racing that included an inner hub, pressure plate, fiber drive plates, steel drive plates, springs and a CNC-machined clutch cover that is hard-anodized. Going bigger usually means more performance, but that doesn’t mean the increase in performance will be in the places you want it. Our Cylinder Works 270SX-F project in phase one did increase power down low and in the midrange, but not so much on top. In phase two, the combination of the FMF exhaust, Twisted Engineering head modifications and the Vortex ignition with a custom map designed by Jamie at Twisted Development gave the bike increased performance throughout the power curve. This made the bike easier to ride for all classifications of riders. Total gains with the complete build are 8–10 horsepower, depending on the type of fuel being used. The bike is currently running on a 50/50 mix of VP Racing T4 and pump gas. The suspension upgrades from Factory Connection are a little on the soft side for our pro-level riders, but for our target vet intermediate riders, they are spot-on. It would be difficult to make it any better. However, is it better than a 2019 model? 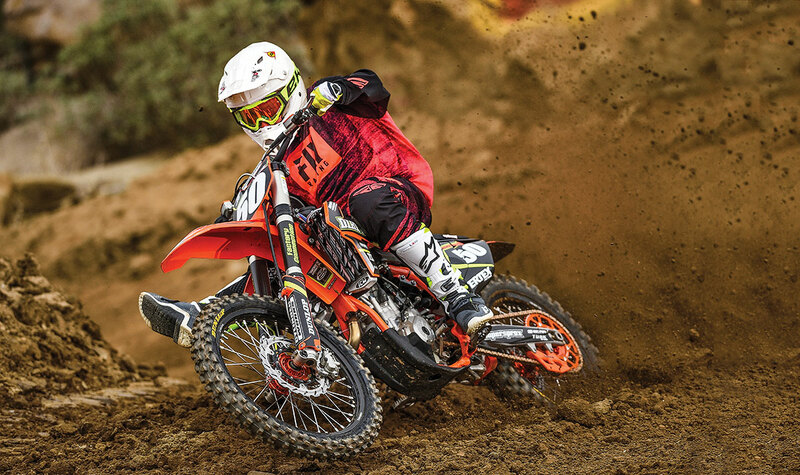 It’s got more horsepower all around and improved rider comfort handling-wise than the stock 2019 KTM 250SX-F, so we’d have to say yes.